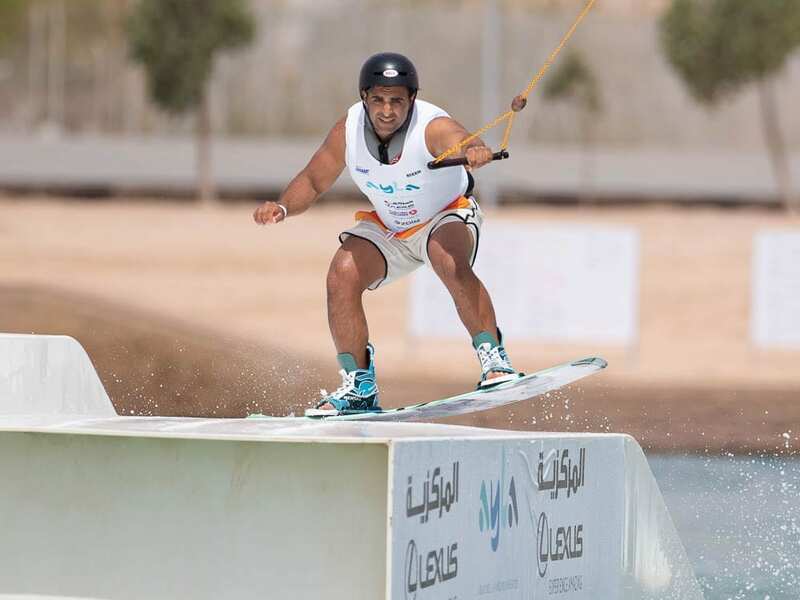 Strong winds on Thursday,10th May 2018, cut short practice for the 57 riders competing in the IWWF Jordan Ayla Cable Wakeboard World Cup 2018, at the Ayla Cable Wake Park, Aqaba, Jordan. Forecasts for Friday were likewise not looking promising so a 2-hour earlier start at 0800 was arranged. Fortunately conditions on Friday morning 11th May 2018 proved ideal and the preliminary rounds were completed without disruption although the wind was beginning to build when the last rider Koki Toyoshima (JPN) completed his Last Chance Qualifier (LCQ) round. First off were the three Open Women’s Qualifiers. In Heat A Reina Kurata (JPN) topped the leader board after her first round. Steph Callar (GBR) improved on her first round score to finish second with both advancing straight into the finals. The remaining six in the group including Sanne Meijer (NED) had one further chance to qualify through the LCQs. In Heat B, third off the dock Courtney Angus (AUS) set the benchmark with a score of 64.33 only to be topped by Mari-Lils Siimon (EST) with 67.67 and then by Maxine Sapulette (NED) with 70.67. Angus improved on her first round score to move into 2nd place after her second round only once again to be beaten by Siimon 73 and Sapulette 72. In the final Open Women’s Qualification Heat C Duan Zhen Kun (CHN) finished with a Toeside 540 off the kicker to take the lead with 48. It was a shock therefore when reigning world champion Julia Rick (GER) fell on her second trick. Fortunately in her second round a huge Vulcan and a Toeside 540 off the kicker put her in the lead with Alena Rogacheva (RUS) improving in her second round to take 2nd place and relegate Duan to the LCQ. It was straight into the Men’s qualifiers with the first of six heats for the 29 invited men riders and the six qualifying through the pre-qualifiers. First off the dock was Jahir Lopez (PAN), second, Pedro Caldas had a monster ride including a backside 720 and a huge S-Bend finishing with a score of 73.33 with Philipp Turba finishing 2nd with 65. There were further upsets in the first round of Heat B when last off the dock Ricardo de Tollis (ITA) fell on his second trick, leaving Patrick Hanes (CZE) lying 1st and Daniel Araujo (BRA) 2nd. Marc Shuster (USA) improved on his first round score but not enough to make the top two. De Tollis made amends in his final pass to take the number one spot, relegating Araujo to the LCQs. History was made with the first Jordanian Cable Rider, Tarek Ziad, taking to the water in Heat C. Hong Kong’s Alvin Louie finished in 3rd place after the first round but was relegated to 4th after Dimas Vanini (ARG), Hamid Khodsiani (IRN) and Louis Mistaudy improved on their first round scores, with the later finishing with a Backside 900 off the kicker. Friday Onwe Pharez (NIG) was first off the dock in Heat D, whilst the youngest rider Jui Pin Lin (Noodle) missed the handle on his first trick off the kicker. Angelino Louise Linao (PHI) had a good run only to fall on his last, a Tantrum to Blind, to take the lead holding off the challenge of Robin Leonard Jensen (DEN). Liam Peacock (GBR) completed an entertaining run to lead round one with last off the dock, Miles Toller (GER), coming close but finishing 2nd after falling in his last trick off the kicker. In his second round Jensen put in an intense run only to go down on an S-Bend to Blind, while Toller improved on his first round to finish 1st. Heat E turned into a battle between Diego Barragan (COL), Sebastian Dunn (AUS) and Sam de Haan (NED). Dunn took the lead finishing with a Backside 720 to hold off de Haan who missed his 540. In the final Heat F second off the dock Olivier Orban (HUN) started with a 720 off the kicker followed by a series of tricks to take the first round lead which Dominic Gohrs (GER) could not beat despite miraculously dropping the handle but managing to catch it again. Everyone but Koki Toyoshima improved on their first round scores with Gohrs relegating Toyoshima to 3rd after completing a Heel 720. The LCQ’s were equally entertaining with riders desperate to secure the one place from their one round in their heat to advance into the finals for the women and the semi-finals for the men. In the Women’s LCQ Courtney Angus held off the challenge of seven others to advance to the finals. In the second Women’s LCQ heat Julia Castro Christiansen (ESP) advanced after Duan Zhen Kun (CHN) failed to complete her final Toeside 540. In the Men’s four LCQ heats Ariano Blanik (GER) advanced from the first heat along with Nikita Terskov (RUS) from the second. Diego Barragan (COL) blew everyone away with a Double S-Bend to Blind finishing with an Off-Axis Back 540. Koki Toyoshima (JPN) put in a clean performance including the Table Top and Fun Box and Backside and Frontside 720s to clinch the final spot in the Men’s semi-finals. Competition resumes on Saturday at the scheduled time of 1000 with the Men’ Semi-finals and the Women’s and Men Finals. About the IWWF: The International Waterski & Wakeboard Federation (IWWF) is the world governing body for towed watersports and has 91 affiliated Federations world-wide. It was founded in 1946 in Geneva, Switzerland. It is recognized by the International Olympic Committee (IOC) as the sole authority for Waterski and Wakeboard.. The IWWF is an affiliate member of the Association of IOC Recognized International Sports Federation (ARISF). The IWWF’s sports disciplines include, amongst others, Tournament Waterskiing (slalom, tricks & jump), Wakeboard, Cable Wakeboard, Cable Waterskiing, Disabled Waterskiing, Show Skiing, Ski Racing and Barefoot Waterskiing.